If you are a teacher and you are creating a really cool program in your classroom you should scale it globally. But if you think you should also make money from scaling your awesome program, it’s probably not the best way to go about it. As a public school teacher going the proprietary route in terms of IP would lead to many conflicts of interest – a non-proprietary route (or at least a mix) is much easier. You have to ‘give it away’. Some teachers or students might have problems about giving their work away. Of course, you always need a ‘bread and butter’ gig that pays the bills. But on top of that, participation in a coding or entrepreneurial community (or similar), to gain experience, knowledge, and reputation is increasingly possible. Consider ‘giving your work away’ in exchange for these valuable assets. Going the open innovation/open source route is a good model for students in schools as a basis for project based learning. Assuming they have access to internet, cloud computing, and [mobile] devices, students can innovate using increasingly available webtools. The ‘soft skills’ learned by working in teams to solve problems are transferable and sought after by both the private and public employment sectors. Service learning, project based learning, entrepreneurship education, and STEAM are all well served when students understand their level of IP commitment, especially because cloud computing now allows for student projects to last over many years. A lot of work can go into a three or four year project, and a proprietary IP stance won’t likely stimulate innovation or cooperation. If it’s innovated at school, student (and teacher) work in the form of cloud stored portfolios should be saved and shared in a school improvement repository/library/bank – a sort of ‘creative commons’ for the local community – viewable by parents, staff, students, district supervisors and trustees. This data can also be used to attract mentoring or outside partnerships and/or investment, in effect transforming the school into an innovation hub with classroom as incubator and school as accelerator. However you define open source (I’m studying Github Open Source Guides), the tools available for working this way are becoming more and more available. Google, AWS, Twitter, Facebook, Instagram, Linkedin are all free or relatively cheap tools for scaling your awesome program. Twitter is extremely powerful, and although ‘following’ and ‘liking’ is not supposed to imply reciprocity, if used well it can inspire collaboration. Choosing the more non-proprietary route, teachers can be more assertive (i.e. pushy) at acquiring resources for their students. Resources can come in the form of funding, mentoring, and equipment, to promotion on social media, and so on. School district legal departments can more easily facilitate this type of open innovation by providing teachers and students with some basic IP guidelines. Also, teachers and students need to do their homework and learn more about IP law. We can use and grow our present internet age economy of knowledge abundance. It is not constructive to stray too far to any one side of the non-proprietary or proprietary debate – we all need to mix it up according to our circumstances. Education can share the hope and skills that our internet age brings, and open source and open innovation projects can make local and global solutions happen. *This article is not a substitute for professional legal advice. This article does not create an attorney-client relationship, nor is it a solicitation to offer legal advice. Thanks! Rich Baxter is a founder, educator, not a lawyer, and advocate for social innovation, the arts, and entrepreneurial education. The Bootstrapping Checklist was Shortlisted in the Teaching Delivery Category and Showcased on December 5, 2016 and December 4, 2017 in Philadelphia at the Reimagine Education Awards and exists in the Creative Commons as an open innovation project. The Bootstrapping Checklist is a global initiative because it uses Twitter and YouTube to promote the program, and Github and AWS to build the website hosting the short slide deck on ‘How to Run the Bootstrapping Checklist’ . When teachers or groups of students download the slide deck and then try the 5-step process, I wish them to post videos about their experiences on our YouTube or Twitter – this is how we are building community. Thank you Reimagine Education for inviting me to another inspiring event and for allowing me the privilege of presenting again The Bootstrapping Checklist, an open innovation program happening in my classroom in Toronto. The program is a grassroots online student social network centered around social entrepreneurship. As a an educator in Toronto, I am heartened by the work being accomplished at University of Pennsylvania Graduate School of Education. The Education Entrepreneurship Master’s Program is forging the alloy of Education Entrepreneurship with The Graduate School of Education, The Wharton Business School, The School of Engineering and Applied Science. We need to attract the best and brightest ‘teacherpreneurs’ to help develop the next generation of teachers and support and inspire those who are innovating now in classrooms locally, nationally, and globally. I have included the slide deck from my Bootstrapping Checklist 2017 Reimagine Education Presentation, but for ‘How to Run the Bootstrapping Checklist“, please click here. Entrepreneurial skills such as resilience, focus, commitment, people management, self-reflection, and a positive attitude are not intuitive skills. They take practice and dedication and it becomes a momentous event for a young student to begin to understand that just because they don’t have many of these skills, it doesn’t mean that they will never be able to develop them. This revelation for many kids lifts a weight for those that begin to grasp that skills are developed through dedication and practice, and that because these can be learned and taught, they become very much accessible to all students. We are generally predisposed as humans to shy away from conflict, and so teaching kids to embrace change and challenge as opportunities is critical at an early age if they are to grow into adults who will be able to excel in our uncertain future workforce. So entrepreneurial and change management skills are important skills to teach in our classrooms. One of the things I notice through the Bootstrapping Checklist is how students learn to relate to each other in a more professional way – they start to look at school as an opportunity to practice skills to help them relate to each other in a professional manner in order to try to realize their project visions. Students learn to separate their behaviour from their personal identities, meaning if they behave badly out of frustration or anxiety during a tough team meeting, it doesn’t mean that ‘that’s who they are’. It means they behaved badly in a stressful situation and entrepreneurial education of this type teaches kids to recognize and respond to challenge, rather than simply and continually reacting to stress. Thus students begin to objectively see how their language and the way they and their peers speak to each other can positively or negatively impact the group’s success. They also learn that problem solving is hard, that getting frustrated is normal, and that there are specific skills and strategies that can be applied to mitigate the difficulties of complex problem solving. I claim that the Bootstrapping Checklist can produce ‘cohorts of students who are more than HigherEd ready’ – and what this really means is that students learn to understand what agility looks like in a constantly changing and unpredictable global and local employment market. A fundamental quality of the Bootstrapping Checklist is what I call guided iterative inquiry – it is very much process oriented design thinking, heavily influenced with the Japanese concept of Kaizen, or continuous improvement. Teachers are fortunate in Ontario because we have a lot of freedom to plan curriculum delivery in our classrooms, and Ontario is a global education leader in inquiry and project- based learning, but we need to go further and normalize ‘cultures of innovation’ in our schools – and so teachers must take up the mantels of ‘teacherpreneurs’ and model this mindset for the students daily. I go as far to suggesting that schools, especially middle and high schools, should be turned into ‘innovation hubs’, where the classroom is project incubator and the school/district is accelerator – cloud computing and iterative design thinking can practically support student projects over years – with the potential of student projects actually deploying in communities. This is a paradigm shift of the purpose of our education system – to produce students who are not only skilled at change management, but who critically have not lost their desire to be imaginative, empathetic and creative people who are excited at the opportunities that constant change and uncertainty produce. We need to teach our kids never to lose their brilliance, and schools need to support this creative drive from the beginning to middle school, to high school, and beyond. Rich Baxter is an educator and advocate for social innovation, the arts, and entrepreneurial education in our public schools. He is honoured to be a Judge for the 2017 QS Stars Reimagine Education Awards. Education is merging with neuroscience, quantum computing, and AI, redefining what it means to be human and thus what it means to learn and to teach. Where does that put education as a human endeavor and what other factors do we need to consider in order to take full advantage of the present knowledge revolution? The game changers that support 21st Century Technology and Learning are cloud computing, more connectivity, cheaper devices that enable social networks, and AI enabled extreme personalization. Online learning communities immersed in organized cycles of inquiry are an important aspect of the future of education – we need to promote the facilitation of these communities in our young learners. Excellent teachers, along with AI, will support all of these technological interventions and more, but will we learn when to ‘turn the AI off’, or risk merging with the Neuralink – it will be there if you want it. Measuring success will be more shared, less quantitative, and supported by valued competencies – we give too many linear assignments – we need to balance these with cyclical inquiry holding unknown outcomes at the outset in order to allow students to practice the competencies that mitigate the stress of ambiguity of complex problem solving. The arts are critical – art is the highest form of human expression. Education is a human endeavor, and as such it must respect our nature as creative beings – cutting funding to arts and humanities makes no sense. Coding is important, but frankly, a lot of it will be automated by the time my students reach working age (BTW – there is no STEM, only STEAM – one has only to look at Hypercars as examples). The process frees the mind – classrooms must do more extended cyclical inquiries to 5 hours, 5 days, 5 weeks, and eventually to 5 months. Evaluation and assessment can be deeper within a longer cycle, and the competencies practiced become just as/more important as the summative marks achieved at the end of the process. Inquiry = deep questions to promote access + facilitated responses + critique and comment to encourage commitment to a mastery mindset. Deep Learning doesn’t happen without deep questions, and ‘siloed’ mini-lessons only serve to further fracture our students – students need longer, deeper, and more cross-curricular/interdisciplinary projects for context and relevance – service learning is a great way to solve local and global community problems, we should focus more on this. Personalized Learning means a fundamental shift in responsibility on the part of students and their families who require more guidance and encouragement to curate knowledge, competencies and empathy in pursuit of future dreams, plans and realities in terms of education, employment and happiness – in a very uncertain but hopeful future. Storytelling and blogging remain crucial for relevance and for sharing of student voice. Family curation of career goals will become more important, as will be the curation of social media legacies of individuals – that’s why blogging is such a relevant and authentic activity to teach in schools – it is their voice through curated narrative that gives relevance to these activities – they are forging their digital legacies. Students need guidance to curate their own competencies to help them develop their own growth mindset. Teach kids what their strengths and needs are and how to communicate those to other people, how to collaborate with others, and how to manage projects and assignments, and have a future vision of happiness. Engaging in collaboration and not knowing the outcome at the outset and being able to manage that ambiguity is important to teach our kids. Being able to feel comfortable with complexity and public speaking, pushing through the stresses of innovation – and realizing that none of these habits are necessarily intuitive — they take practice to master. Authentic personalized learning requires that 21st century schools are filled with students and families who are provided the opportunity to take on more responsibility for their learning, in response to the exponential increase in resources provided by the Internet. Excellent teaching and AI will guide this upward innovation movement, but ‘a shared leadership’ will facilitate more and more partnerships within communities and between them. 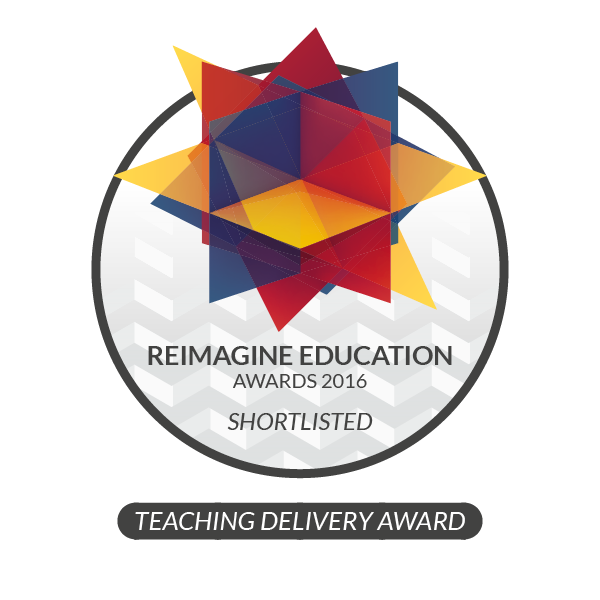 We are proud to know that our work is engaging the most innovative educators in the world, and momentum to see our program scale has increased since we have been Shortlisted for the Reimagine Education Teaching Delivery Award 2016. My students know that their work is being considered internationally, and they are empowered to continue working hard to address issues that affect our community – this is our greatest success. Graduates keep visiting to receive updates about projects that they used to work on. One project in particular, Broadcast Out Loud (BOL), is in its third year. BOL is a media service for the school community that will engage students on their mobile devices to keep them connected to school events. Over the past three years, about 30 students have worked on or are currently working on BOL – with the ultimate goal of actual deployment to classmates and the community. The Bootstrapping Checklist is excellent training for students who need to practice the entrepreneurial ‘soft skills’ and 21st century competencies, as they learn to construct and to connect with each other in an impassioned and respectful way, fully anticipating the problems that lie ahead, and yet with an attitude toward committing to the process for the benefit of themselves, their families, and their communities. This post explores the intersection between ‘Ed and Tech’ and the conjunction of good pedagogy and ICT best practices in our classrooms. I took a trip out to San Francisco this past summer to try to get a feel for how the tech sector is influencing education globally and in Ontario where I live. As a grade 8 teacher in a tough school in the east end of Toronto, I feel I need to have a vision of the future, or at least the next five years, for my students and for the community that I serve – a vision that might articulate a path to a future where my students can thrive in our global economy. In a full week I visited Google and Stanford, had ribs and a Big Daddy IPA at a grassroots community meeting at Bayview’s historic Sam Jordan’s Bar, visited the Golden Gate Bridge, spent an afternoon at City Lights Bookstore (a bastion of American social justice and labor movement literature), and rode the T Third Street metro line, ending a week-long trip in the truly inspirational city that is San Francisco. Silicon Valley and City Lights Bookstore, private enterprise and public spirit – how could it be that these two worlds co-exist in such close proximity? As an educator facing imminent disruptions to my industry, I’m thus grateful and hopeful that because of my trip, I think I do see a conjunction of the two worlds, and thus have begun to think harder about my future profession by fully embracing all that tech has to offer – including AI, AR, VR, gamification, simulation, deep learning, machine learning, and adaptive learning. So what does it mean to fully embrace tech as a public school teacher, and what do I bring to the table? I’m convinced that more teachers need to become sophisticated PMs, and many good teachers already are. Public schools need to become innovation hubs by accessing and leveraging increasingly cheaper cloud-based computing and mobile technology. Have we really begun to consider the role of public schools and school boards as potential student project incubators and accelerators? Facilitated by iterative design thinking fueling on/offline, micro/macro learning communities, the classroom as ‘incubator’ begins with teachers teaching kids about growth mindset and commitment – especially about commitment. School boards can then be encouraged to act as ‘accelerators’ to sustain socially innovative student projects over longer periods of time and with the aid of cloud based computing. Iterative design in classrooms involves a structured approach married with longer design cycles, say 3-5 months in the case of middle school students, and shorter, more frequent iterative cycles for older students, sustained using cloud computing and mobile devices – this is where pedagogy and ICT merge to offer true potential disruption. Iterative design holds the dichotomous nature of being on one hand beautifully simple, and on the other deeply complex, depending on the level of commitment of the participants. It is inclusive, and it coaches, and it serves as a reference point when projects get confusing and teams get frustrated – the cycle guides and once completed, students can commit together to another cycle, or respectfully move on to other projects with reputations enhanced. On my trip I remember asking my mentor at Google if he or any of his colleagues had predicted the ‘Pokemon Go’ phenomenon of this past July – and he said that they hadn’t. This inspires me to believe that no matter how much we think we have everything under control, there is still such a level of unpredictability in our explorations that it opens up spaces for individuals and communities to participate on many levels. This actually brings hope to young people who are often overwhelmed by the amount and sophistication of today’s technology. In other words, the more my students use technology in a purposeful way, the more spaces open up for unpredictable uses of technology by them. This is good news both for the technology sector and for public education, and for me it resolves a perceived dichotomy between both. Kids are not loyal to brands of tech, and thus given the freedom to innovate using a structured approach, will jump from tech tool to tech tool depending on need and want. This opens up the unpredictability of tech usage in the classroom that at once might put tech companies on edge, because kids just aren’t that loyal to tech brands, but it also opens up all kinds of possibilities for both sectors because we just can’t anticipate how kids will use technology (the way my students use social media to organize study groups is a perfect example of this). The more we encourage our students in public schools to use technology in the service of their communities via iterative design thinking and project based service learning, the more opportunities open up for both sectors, thereby bridging the two worlds that appear to be at odds, but in fact might well have more in common than we suspect. So, the more students use tech, the more possibilities open up for both sectors. Win-win. To achieve this resolution of ‘Ed and Tech’, public school teachers need to bring their project management skills to their communities and leverage tech as much as possible to advance socially innovative student projects and thus add value to their community’s resources in terms of real and social capital gained. The tech sector needs to continue to push advances in AI, VR, AR, simulation, adaptive and machine learning in education – and together we can inspire our students to participate in our increasingly collaborative global sharing economy by opening more and more possibilities, thereby empowering our students to be real agents of positive change. After all, it’s not the tech sector’s job to bring in issues of social justice to public education, they are private enterprise with their own proper goals. It is up to teachers to present their case and step up by facilitating tech’s use in classroom. To this very end, iterative design thinking, manifested as The Bootstrapping Checklist for example (the program I created and run with my grade 8s), properly blends pedagogy and ICT and for now, resolves this EdTech dichotomy in my small classroom to very satisfying results. The power of iterative design thinking such as The Bootstrapping Checklist is its rich and deep simplicity – on the surface, it is a distillation in the form of an infographic that serves as a reference point for discussion around the implementation of complex student projects – but the beauty lies in its structure, and the structure allows for the group to foray into unknown territory with security, exploring complex problems and living through ambiguity with the safety and comfort that the design cycle provides. This is excellent training for youngsters who will need these skills as they enter the global marketplace – but these skills also serve them now, as they learn to construct and to connect with each other in a very impassioned and respectful way, fully anticipating the problems that lie ahead, and yet with an attitude toward committing to the process for the benefit of themselves, their families, and their communities. This is what iterative design thinking teaches us, and because it is so powerful and yet so simple, it is incumbent on our teachers and administrators to facilitate iterative design thinking in our classrooms right now. The Bootstrapping Checklist has been accepted into the 2016 Reimagine Education Awards competition in the Teaching Delivery category – shortlisted projects will be announced October 28, 2016. This week on May 26 we are thrilled to host the TD Toronto Jazz Fest’s Groove & Graffiti at Robert Service Sr PS with Toronto artists Mediah and Elicser and with mentoring from students at Central Tech and a dozen of our own Grade 8 students. As a leadership opportunity for our students, this promises to be a great day of art and music and mentoring and we are grateful to our friends and sponsors for making this happen – particularly Mr. Evond (Mediah) Blake for his tireless support, and Ms Kathleen Moll, art teacher extraordinaire.